A groundbreaking marine electric drivetrain will be shown in Europe for the first time at this year’s Cannes Yachting Festival. The all-electric system is the only drivetrain on the market to match the performance of leading thermal engines, and is without parallel in power and torque. “All-electric systems seen in superyacht tenders up until now have tended to be token efforts – they’re electric but they don’t perform to a functional level, or with an adequately-long battery life,” says distributor Jonathan Edgar of JP RIBS. The systems are manufactured in Canada by LTS Marine and are already widely-used and proven in North America, though haven’t been available to the rest of the world until now. They’ll be on display on the JP RIBS / LTS Marine stand at the Cannes Yachting Festival stand QML339. LTS systems feature permanent-magnet brushless motors for exceptional performance, a power dense electronic inverter, onboard intelligent chargers and reliable and safe, state of the art liquid cooled battery system. JP RIBS is owned by the current captain of a 41metre in-build yacht and a 27metre Wally, and has the exclusive contract to distribute the electric propulsion systems throughout Europe and the Asia Pacific. LTS Marine has been successfully installing state-of-the-art electric propulsion systems in various types of boats and heavy-duty commercial vehicles since 2009. The Canadian company’s systems are designed and assembled in its Montreal facilities, and are the fruit of numerous years of testing and research. They’re the same electric drive systems found in high performance land and sea electric and hybrid vehicles, and haven’t been available in Europe, Asia, or the Pacific until now. 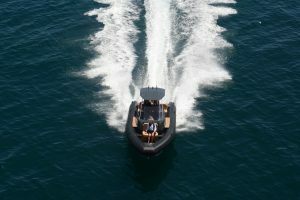 “LTS Marine has a proven track record in creating powerful marine electric drivetrains and, combined with JP RIBS’ craftsmanship, high quality, and leading attention to detail, we’re thrilled to be able to offer zero emission drive trains and tenders to the superyacht market,” says Bruno Tellier of LTS Marine. With his knowledge of the superyacht industry, JP RIBS CEO and captain, Jonathan Edgar knew the European boat building industry was already interested in green energy – he felt the only thing missing was green energy without compromise on performance. The two main elements of LTS Marine systems are the motor and the battery pack, which are the result of years of research. The electric motors installed in LTS’s propulsion system are manufactured by the Canadian company TM4 for the automotive industry. Not only do they have remarkable technical characteristics and one of the highest efficiency rates, but also they exceed the strictest norms of safety in the industry. LTS Marine has developed its battery systems specifically for the marine industry with safety and performance in mind. Adhering to the strictest automotive safety standards, LTS Marine only uses components from world-class suppliers with millions of cells in service driven over 20 million miles since 2004. Main components used are designed and tested for the automotive market and in adherence with Marine Standards, assuring compliance with current industry best practices. LTS systems are built to endure demanding real-world conditions and backed by a first-rate warranty, for customer peace of mind. LTS Marine systems will be available to view at the JP RIBS stand at the Cannes Yachting Festival 2017 and METSTrade Show 2017.